Thanks Robert. Any comments are welcome! that's cool!! but how did you add the foliage??? Well all particles in ICE can have their own shapes. Once you've finished building the branches, take the last set of branch positions and randomly emit loads of particles, and make those disk shaped. A tried to do your compound but I cannot get the trees to render properly. I'm just a begginner with ICE, so I really don't know what I'm doing sometimes. I really appreciate your teachings. Thank you :). Well if you're a beginner, you're doing pretty well so far. If the problem is that your tree doesn't render the same colour as it looks, is probably because you need to apply a material to your Point Cloud, and in there get an Attribute>Colour node and change it from Use Default Value to Colour. Pipe this into your Material. 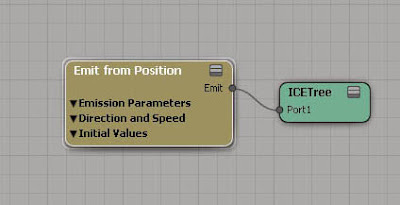 It's the way you get colour from your ICE tree into the Render Tree. Any problems, let me know. Thank you for this tutorial! With love! First I have to say this compound is very cool and it's a very good tutorial on how to set it up. However, I was wondering if you could give me a little tip on something I am a bit confused about. I was thinking of using the compound to spawn trees when some other particles hit a surface (imagine seeds flying in the air and hitting the ground giving rise to trees growing up at the hit location). If would be awesome if you have time to give a little tip. Thank you. I'm glad you like the tutorial and have managed to get it to do what you want. With regards to your seeds setting off the tree growth, this should be possible. I haven't done any work with one pointcloud setting off another so I'd try and do it all in the one. Basically you could use the StateId's to control what's happening. So for instance, create a particle with a stateId different to those used in the tree, when it hits a surface, use that location to set off a tree. 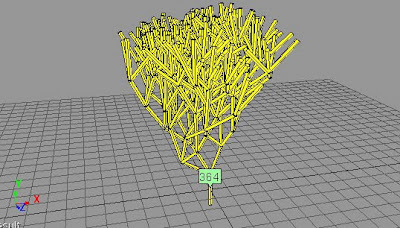 You really need to package up the tree building nodes into a self contained compound that would allow you to control all parameters from the top level. When the 'seed' hits, set a timer going that controls the life of the tree. Something like that. Let me know how you get on. firstly want to thank you for this awesome tut. I just got a question/ problem to ask you, Chris. I'm glad you like the tutorial. The repeat loop is the main one that controls how many times to duplicate the branches. The clone is the number of branches per loop. If your loop isn't setup correctly, even if you have just 1 cloned branch, it could still go out of control. Feel free to e-mail me directly if you have a problem or even if you resolve this one. I'm glad things have worked out and that the tutorial helped. It would be good to see your finished project!! Chris thank you so much for posting this. It was excellent. I'm still learning Softimage and ICE but I found this pretty easy to follow, with a little confusion on the loop counters, but I got it working. 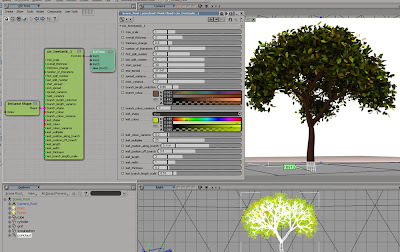 For creating leaves you suggested "Once you've finished building the branches, take the last set of branch positions and randomly emit loads of particles, and make those disk shaped.". Can you share any tips or suggestions on how to determine those last branches? The last level of branches will be determined by their State ID's, which depends on the number of times you've looped to create the branches. So if the trunk is State zero, and you've looped three times, your last level of branches will be State 3, possibly. So you can simply use an If Equals condition on the state id's to Clone leaves. Use the On Creation ports of the Clone Point node to randomise the positions and rotation of the leaves, and change the shape of course. Here is a link to my project where I used your tutorial. It got a bit delayed because I travelled on vacation shortly after completion of the project, but here it goes :) I hope you like it - it is my first project using 3D software like Softimage. Great Stuff!! I *do* like the trees!! Stumbled across this tutorial as I learn more about ICE, thanks for posting it up. I'm working in 2012, it seems the 'Repeat with Counter' compound has been added to the ICE database (yay) but it doesn't work the same as i see posted in your shots. Also, the 'Set State' node is no longer in the list. Any pointers on how to adjust the ICETree to make my trees grow? Hi Jonathan, only just saw your post, sorry I don't check this much. Did you figure out what you were looking for?